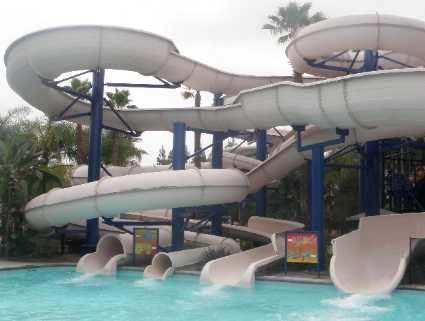 Visit The Wave Waterpark in north San Diego county in Vista, California. This small friendly waterpark is perfect for kids and families to enjoy the beautiful San Diego sun! 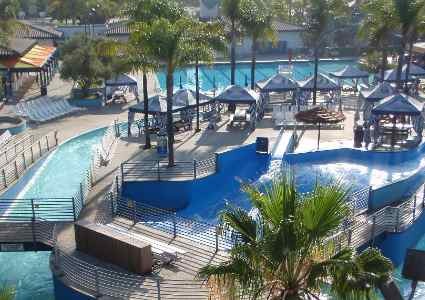 The Wave Waterpark is a small, kid friendly San Diego water park that is perfect for summer days in north San Diego county. The park is owned by the city of Vista and its small size makes it easy to keep track of kids. Other San Diego water park choices include Sea World Aquatica water park, located in south San Diego in Chula Vista, and Legoland waterpark, which requires admission to Legoland. So if you are in the north San Diego county area and don't want the drive to Chula Vista, or the price of Legoland admission, this Vista water park is a nice alternative for a hot summer day. If you are in the north LA area, visit the Six Flags Hurricane Harbor waterpark. The Wave Waterpark offers a variety of rides and water attractions, including a slide tower, flow rider, riptide slide, lazy river, splash structure and competition swimming pool. They also offer swimming lessons, junior lifeguards, birthday parties and more. Operating Hours: Daily from late May to late August, then weekends through mid September. Hours vary but typically 10 - 4 on weekdays, 11 - 5:30 on Saturday and noon - 5:30 on Sunday. On some Fridays there is a Friday night splash event from 4 - 8 PM. Ticket Prices: $19.95 if you are over 42" tall, under 42" is $15.95. Spectator Admission costs $19.95, with a $4.00 deposit returned upon park exit with a dry wristband. Season Passes: Individual Pass - $69 each; Family Pass (4 or more) $64 each. Discounts may be found, such as 2 for 1 offers through Groupon. San Diego Zoo Safari Park in Escondido. Food: You may purchase burgers, burritos, pizza, ice cream and drinks at the Surf Spot Grill. No outside food or drinks allowed. Directions to The Wave Waterpark: From Interstate 5 in Carlsbad (north San Diego county), take 78 East to Vista Village Drive. Exit and turn left onto Vista Village Dr. Turn right at Wave Drive. The water park is on your right hand side immediately past Burger King restaurant.